A species with a very restricted distribution in Northern Ireland, being found only on basaltic or chalky soils in the vicinity of Black Head and White Head on the Co. Antrim side of Belfast Lough. It is usually found in only very small quantities at these sites, frequently apparently absent for several years at a time, but disturbance of the soil can produce a mass of plants from dormant seeds. 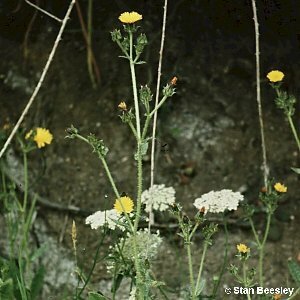 It is an unattractive, bristly-leaved annual with yellow flower-heads. The bristles arise from white swollen bases on the leaf surfaces. It may not be native in Ireland. All names: Picris echioides L.; Helmintia echioides (L.) Gaertn.